Are you ready to hear Jason Mraz belt out his new songs and classic hits at his only Asia stop this year? 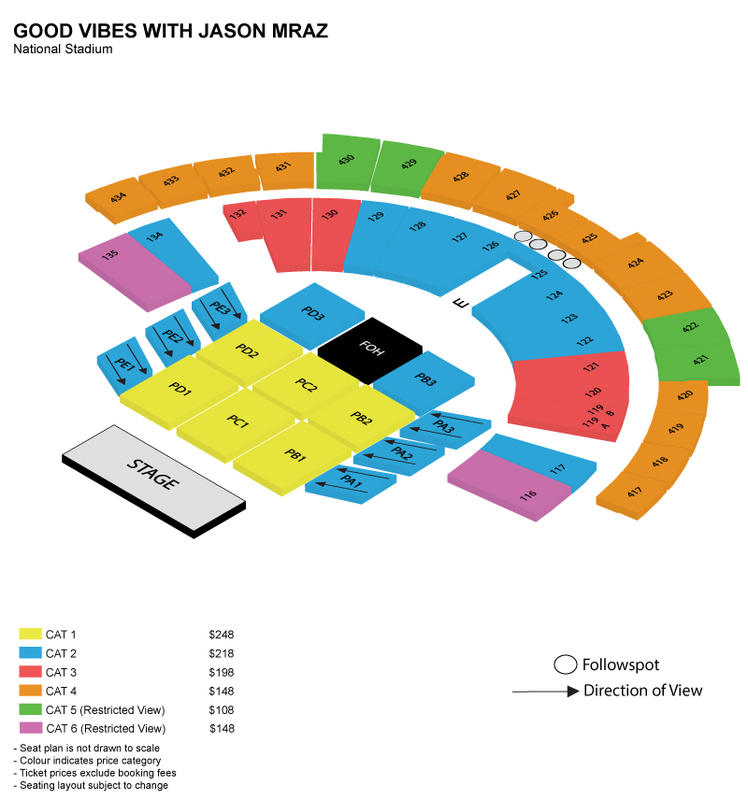 Here's what you need to know for a smooth experience at Good Vibes with Jason Mraz! 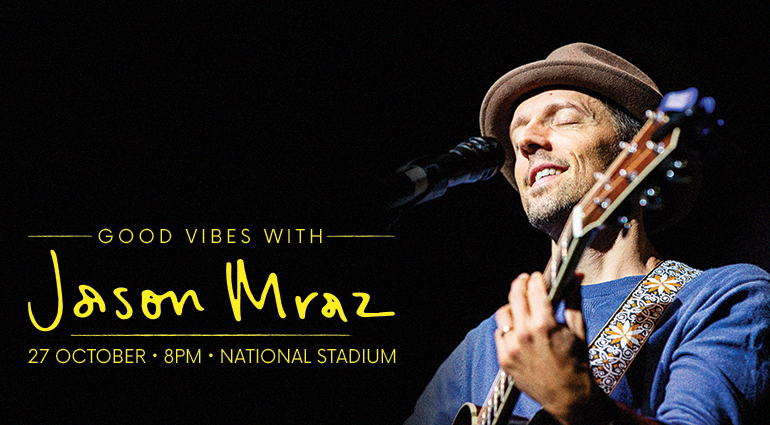 Multiple GRAMMY® Award winner, platinum selling artiste Jason Mraz will perform at the National Stadium on 27 October. This concert, held in conjunction with the final edition of the BNP Paribas WTA Finals Singapore presented by SC Global, will be Mraz’s only stop in Asia this year. A chart-topping headliner, Jason Mraz has earned numerous diamond and platinum certifications for his various releases, including his classic singles “I Won’t Give Up,” “Lucky,” and the record-breaking “I’m Yours.” He has won two Grammy Awards, received the prestigious Songwriter Hall of Fame Hal David Starlight Award and sold out fabled venues such as The Hollywood Bowl, Madison Square Garden and London’s O2 Arena. It is a testament to the generosity of spirit in Mraz’s music that so many people have chosen his songs as the soundtrack to major moments in their lives, and new memories are certain to be made with the songs on his upcoming sixth album, Know. The album serves as a follow-up to the 2014 LP ‘YES!’, and is Mraz’s first full-length studio recording in over four years. Know. is a collection of letters, introduced through its first single, “Have It All” which was orginally conceived after Mraz received and translated a blessing from a Buddhist monk during a moving visit to Myanmar in 2012. It stands out as a song with a hopeful message to help him and others heal and move forward. The current smash hit is ascending the Top 15 at Hot AC radio outlets US-wide and has more than 4.5 million streams in the U.S. alone. Other notable songs include the recently released “Unlonely”, one of Mraz’s favourite track from the album which hearkens back to some of his early, beloved songs. “Making It Up”, a collaboration with his songwriter friend Bob Schneider about how anything is possible and “Better With You,” which was inspired by his marriage. To further herald Know. out on 10 August, Mraz will embark on a hugely anticpated North America summer tour “GOOD VIBES”. He will bring this one night only show to Singapore. Get ready to hear Jason Mraz belt out his new songs and classic hits like “I’m Yours”, “I Won’t Give Up”, “Lucky” and more! *Payment must be made with The Centurion® Card issued by American Express International Inc. in Singapore. ^Payment must be made with an American Express Card issued by American Express International Inc. in Singapore, excluding American Express Corporate Cards and American Express Cards issued by DBS Bank Limited, United Overseas Bank Limited and Citibank Singapore Limited.